Depending on what type of events you’re running, there’s a good chance you’ll be using staff to help you put it together. Whether it’s theming a large space in a venue for a Christmas party or helping to run a staff team building treasure hunt, it’s unlikely you’ll be able to do it alone. It might be that you launch your company with enough skilled event staff to help with the aspects of your particular business. 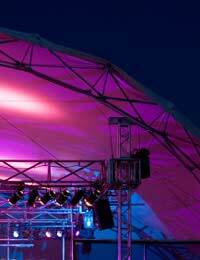 If you have a company that specialises in stage construction for example you’ll definitely need to use rigging staff. What Do We Mean By Rigging? When we talk about rigging for an event it’s not quite the same type of rigging you get on a ship. But the term probably comes from that. Rigging for events is the support that goes to hold structures together, just like rigging on a ship holds all the components together there. It could be for stages, it could be lighting rigs, or sound and lights together. There are specialised firms that offer all types of production solutions such as this – your events company might be one of them – and it’s obviously extremely important you get the right staff to put it together. Rig up a stage wrong or rig the lighting incorrectly and you could have a really dangerous situation on your hands. Stage rigging is largely about balance and weights, and putting together complicated rigs takes skill and professional experience. The most popular types of stage rigging include block and tackle, hemp, counterweight, and motorized. Stage rigging holds the whole thing together. When we talk about rigs for lighting, it’s usually stand for lights to go on, whether they’re single lights such as a spotlight, or a group of lights. Another phrase you’ll hear is trussing, which is the frames that go across a room or the top of a stage to support a row of lights. Lighting solutions also generally come with a lighting desk, where an operator controls the lighting throughout the event. Understanding a bit about rigging it’s easy to see why getting the right staff to put it together is of absolute paramount importance. Rigging staff should understand the principles of weight and balance, safe construction and fixing. The companies that supply production solutions such as staging or lighting will usually have their own staff but it’s down to you to check they know what they’re doing! Staff should know and work to all the applicable safety regulations and should be able to demonstrate a clear understanding of any health and safety considerations in each venue or location used. Before the event, it’s very good practice to appoint a dedicated rigging advisor to do a site visit to advise on the best solutions. As yet there are no recognised qualifications that assure you of a rigger’s expertise, but the Professional Lighting and Sound Association is working to set something up. PLASA is spearheading the development of qualifications for the rigging industry, initially focusing on two key areas. The National Rigging Certificate is a scheme designed to give riggers a recognised framework through which their skills and expertise can be demonstrated, and the development of NVQs for the Audio and AV Installation sector will hopefully represent a qualification for this specialised field. But it’s always worth checking with rigging staff to elicit details of their past experience and to ensure they have a good background in health and safety. And don’t be afraid to ask for examples of their work – it’s a good indication of their expertise.